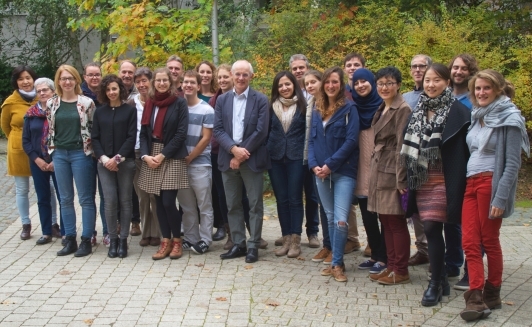 Our lab is interested in tumor immunology, focusing on two questions that are relevant for the development of cancer immunotherapy: (i) what are the mechanisms of production of tumor antigens, and (ii) how do many tumors manage to resist immune rejection and what can we do about it. The experiments carried out in our teams in the 1990’s clearly proved the existence on cancer cells of « markers », called tumor antigens, that make the distinction between the cancer cells and normal cells in the organism and enable the immune system to recognize cancers as foreign bodies that have to be destroyed. This paved the way to new therapeutic approaches aiming at strengthening this ability of the immune system to reject cancers. Some of these approaches have now entered clinical practice, and notably enable to save the life of patients suffering from advanced metastatic melanoma. These new anti-cancer therapeutic approaches, called « cancer immunotherapy » arouse more and more interest from then on, either among oncologists or within the pharmaceutical industry. Nevertheless, despite indisputable clinical success, these immunotherapy approaches are currently limited by two phenomena. The first limitation is the induction of autoimmune toxic phenomena, linked to the fact that in some immunotherapy approaches, the stimulation of antitumor immunity comes along with a stimulation of autoimmunity, i.e. the attack of healthy tissues by the immune system. The second limitation is linked to the fact that many cancers, during their progressive evolution, acquire the capacity to resist the immune attack. Our ongoing experiments aim at understanding those two obstacles and developing therapeutic strategies enabling to bypass them. The first obstacle is tackled by a thorough study on the mechanisms of production of tumor antigens, that enable to define which are the antigens that are the most specific of tumors, and thus to better choose the ones that will have to be preferentially targeted in order to obtain anti-cancer immune responses lacking in autoimmune toxicity. The second obstacle is tackled by the detailed study of the tumor microenvironment, the immunosuppressive nature of which clearly seems to limit the efficacy of immunotherapy. Different therapeutic strategies are being developed to fight this immunosuppression. The tumor antigens are mainly recognized by specialized leukocytes called Cytolytic T Lymphocytes (CTL). These CTLs recognize, on the surface of cancer cells, small parts of proteins called peptides, made up of from eight to ten amino acids, coming from intracellular proteins and that are presented at the cell surface by class I molecules of the Major Histocompatibility Complex (MHC, also named HLA in human). Peptides generally come from degradation of intracellular proteins by the proteasome, a proteolytic particle localized in the cytoplasm and the nucleus. Then, the peptides are moved to the cell surface after association with MHC molecules. Our experiments have shown that there are different types of proteasome, and that those types differ when comparing their ability to produce peptides corresponding to tumor antigens. The result of this is that the antigens presented at the surface of cancer cells partly depend on the proteasome composition of those cells. We thoroughly study these phenomena so as to improve the choice of the antigens that should be targeted for immunotherapy. We also study a new function of the proteasome, that we discovered, that enables the splicing of peptides, i.e. the production of peptides from noncontiguous fragments in the parental protein, following a « cut and paste » process. We also study how some cancers try to escape the immune rejection by “hiding”, i.e. losing the expression of the tumor antigens that « denounce » them to the immune system. Doing so, they unmask other antigens that we try to characterize so as to better fight cancers, in what is becoming a chess game against cancer. Nowadays, it has become obvious that when immunotherapy is inefficient in some cancer patients, it is often linked to the presence of immunosuppressive mechanisms in the tumor site, that prevents the smooth running of the immune system. We study these mechanisms in murine models, notably a transgenic model of inducible melanoma that we have created, in which we discovered that the tumors selectively induce the death by apoptosis of lymphocytes that come to kill them. We study the molecular mechanisms responsible for those immunosuppressive phenomena. We have already demonstrated that one of those mechanisms is based on the degradation of one amino acid, named tryptophan, which lymphocytes absolutely need to reject tumors. Tumors do express an enzyme, called indoleamine dioxygenase (IDO), that rapidly degrades tryptophan and paralyze, in this way, the immune system. In the framework of iTeos Therapeutics, a spin-off that we founded in 2012, we are looking for IDO inhibitors that could be used in anticancer therapy. We also study the mechanisms responsible for the expression of IDO in cancers. We also discovered other immunosuppression mechanisms of which we do study the molecular actors so as to fight them. In recent years, cancer immunotherapy made tremendous progresses and reached the clinical arena by showing its ability to prolong the survival of advanced cancer patients. This was largely based on the discovery of tumor antigens by our groups in Brussels in the nineties, a finding that demonstrated that our immune system has the capacity to recognize cancer cells as foreign bodies. These recent clinical results have generated enormous interest in the oncology field and the pharmacological industry. Yet, clinical benefits remain limited to a subset of patients, and further research is needed to understand the reason for this. Our current research focuses on two aspects that are relevant to this question. The first is the processing of tumor antigens, i.e. the intracellular mechanisms responsible for the expression of antigens at the surface of tumor cells. The second is the tumor microenvironment, whose immunosuppressive properties emerge as a major reason why many patients currently do not benefit from cancer immunotherapy. Tumor antigens relevant for cancer immunotherapy consist of peptides presented by MHC class I molecules and derived from intracellular tumor proteins. They result from degradation of these proteins, mainly exerted by the proteasome. We have identified a new mode of production of antigenic peptides, which involves the splicing of peptide fragments by the proteasome (1). Peptide splicing occurs in the proteasome catalytic chamber through a reaction of transpeptidation involving an acyl-enzyme intermediate (Figure 1). Splicing of peptide fragments can occur in the forward or reverse order to that in which they appear in the parental protein (2). We have now described five spliced peptides, three of which are spliced in the reverse order (3, 4) One of these peptides also contains two additional post-translational modifications, resulting in the conversion of asparagines into aspartic acids, through a process a N-glycosylation/deglycosylation (3). We also showed that the splicing reaction required a minimal size of 3 amino acids for the fragments to splice (4). Both the standard proteasome and the immunoproteasome have the ability to splice peptides. However, their ability to produce a given spliced peptide varies according to their ability to perform the relevant cleavages to liberate the fragments to splice. Legend: Model of the peptide-splicing reaction in the proteasome. The active site of the catalytic subunits of the proteasome is made up of the side-chain of a threonine residue, which initiates proteolysis by performing a nucleophilic attack on the carbonyl group of the peptide bond. An acyl-enzyme intermediate is formed, which is then liberated by hydrolysis. 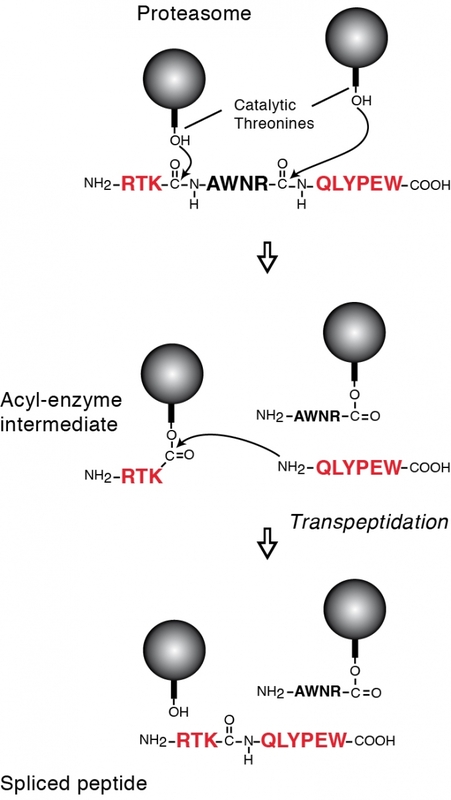 In the peptide-splicing reaction, a second peptide fragment appears to compete with water molecules for performing a nucleophilic attack on the acyl-enzyme intermediate, resulting in a transpeptidation reaction producing the spliced peptide. Experimental support for this model of reverse proteolysis includes evidence that the energy required to create the new peptide bond is recovered from the peptide bond that is cleaved at the amino-terminus of the excised fragment, and that the amino-terminus of the other fragment needs to be free for transpeptidation to occur. The proteasome exists in two forms: the standard proteasome, which is constitutively present in most cells, and the immunoproteasome, which is constitutive in many immune cells and can be induced by interferon-gamma in most other cells. They differ by the three catalytic subunits they use: ß1, ß2 and ß5 for the standard proteasome; ß1i, ß2i and ß5i for the immunoproteasome. We have described two new proteasome subtypes that are intermediate between the standard proteasome and the immunoproteasome (5). They contain only one (ß5i) or two (ß1i and ß5i) of the three inducible catalytic subunits of the immunoproteasome. These intermediate proteasomes represent 30 to 54% of the proteasome content of human liver, colon, small intestine and kidney. They are also present in human tumor cells and dendritic cells. They uniquely process several tumor antigens (5, 6). We are currently studying the function of these intermediate proteasomes, not only in terms of processing of antigenic peptides, but also for other functional aspects in which the proteasome plays a crucial role, such as the regulation of the cell cycle, the activation of transcription factors and the regulation of inflammation and immune responses. We are interested in characterizing the processing of human antigenic peptides that are not produced by the proteasome. We studied a proteasome-independent peptide derived from tumor protein MAGE-A3, and identified insulin-degrading enzyme as the protease producing this peptide (7). Insulin-degrading enzyme is a cytosolic metallopeptidase not previously known to play a role in the antigen processing pathway. The parental protein MAGE-A3 appears to be degraded along two parallel pathways involving insulin-degrading enzyme or the proteasome, each pathway producing a distinct set of antigenic peptides presented by MHC class I molecules. We are currently studying the processing of other proteasome-independent peptides and aiming to identify the protease(s) involved. Presentation of most peptides depends on TAP, which transports peptides from the cytosol to the endoplasmic reticulum. A number of viruses and tumor cells tend to reduce their TAP expression to escape immune recognition. Therefore, there is great interest in the potential therapeutic use of peptides that are still presented in the absence of TAP. We are studying several such tumor peptides derived from cytosolic proteins. We aim at characterizing their processing and identifying the alternative transporter in charge of their transfer from the cytosol to the endoplasmic reticulum. Class I and class II molecules of the Major Histocompatibility Complex (MHC) are responsible for the presentation of antigenic peptides derived from intracellular proteins or from engulfed exogenous proteins, respectively. As an exception to this rule, cross-presentation enables dendritic cells to present on their MHC class I molecules antigenic peptides derived from exogenous material, through a mechanism that remains unclear. Cross-presentation is essential to the activation of CD8+ T lymphocytes against antigens derived from tumors and from viruses that do not infect dendritic cells. It is particularly efficient with long peptides, which are used in cancer vaccines. We studied the mechanism of long-peptide cross-presentation using human dendritic cells and specific CTL clones against melanoma antigens gp100 and Melan-A/MART1. We found that long-peptide cross-presentation does not depend on the proteasome nor the TAP transporter, and therefore follows a vacuolar pathway. We also observed that it makes use of newly synthesized MHC class I molecules that are loaded with suboptimal peptides. These nascent MHC-I molecules appear to diverge from the classical secretion pathway at an early stage and reach the late endosomes, where they exchange their suboptimal peptide cargo for the cross-presented peptide before reaching the cell surface in an endoH-sensitive form. These results indicate an alternative secretion pathway followed by HLA-I molecules that are used for cross-presentation, and may have implications for the development of vaccines based on long peptides. We previously discovered that tumors often resist immune rejection by expressing Indoleamine 2,3-dioxygenase (IDO), a tryptophan-degrading enzyme that is profoundly immunosuppressive (8). We showed that immune rejection was restored by administration of a pharmacological inhibitor of IDO. In collaboration with medicinal chemists in Namur and Lausanne, we identified several families of new IDO inhibitors that will be further optimized to develop drug candidates. We currently pursue functional studies on the mechanisms of IDO-induced immunosuppression, and on the signaling pathway responsible for IDO expression in tumors. Besides IDO, we recently uncovered the role of tryptophan-dioxygenase (TDO) in tumoral immune resistance (9). TDO is an unrelated tryptophan-degrading enzyme, which is highly expressed in the liver to regulate systemic tryptophan levels. We found TDO to be expressed in a high proportion of human tumors. We showed that TDO-expressing mouse tumors are no longer rejected by immunized mice. Moreover, we developed a TDO inhibitor, which, upon systemic treatment, restored the ability of mice to reject tumors (9). These results describe a mechanism of tumoral immune resistance based on TDO expression and establish proof-of-concept for the use of TDO inhibitors in cancer therapy. In April 2012, we have launched an LICR spin-off company, iTeos Therapeutics, which will develop inhibitors of IDO and TDO. We have created a mouse model of autochthonous inducible melanoma expressing a defined tumor antigen (TIRP10B) (10). In this model, melanomas are induced (70% incidence) with tamoxifen, which, by activating CreER in melanocytes, induces the expression of Ha-Ras, the deletion of INK4a/ARF and the expression the tumor antigen encoded by cancer/germline gene P1A. A unique feature of this model is that melanomas first develop as non-aggressive highly pigmented tumors (Mela), which later dedifferentiate into unpigmented highly aggressive inflammatory tumors (Amela). We found that TGF-ß was a key factor responsible for this switch to aggressive tumors, which is reminiscent of the epithelial-to-mesenchymal transition (EMT) described in other contexts. We developed antibodies able to neutralize TGFß1 and TGFß3, and found that the former were able to increase survival of mice in this melanoma model. These results support the use of TGFß neutralizing therapies in the treatment of human melanoma. The loss of pigmentation in aggressive tumors appears to result from the strong inflammation, and we identified a microRNA that is induced by interleukin-1 and downregulates expression of MITF, a transcription factor acting as a master regulator of pigmentation. In this model, both pigmented (Mela) and unpigmented (Amela) tumors express the tumor antigen encoded by P1A. Mela tumors are ignored by the immune system, while Amela tumors are infiltrated by T lymphocytes that are rendered ineffective. We are studying the mechanisms responsible for this ineffectiveness. Our current results indicate that the tumor microenvironment actively induces the apoptosis of tumor-specific T lymphocytes that infiltrate the tumor. We are studying the molecular mechanisms responsible for this apoptosis. Resistance to cancer immunotherapy mediated by apoptosis of tumor-infiltrating lymphocytes. Zhu J, Powis de Tenbossche CG, Cané S, Colau D, van Baren N, Lurquin C, Schmitt-Verhulst AM, Liljeström P, Uyttenhove C, Van den Eynde BJ. Peptide splicing by the proteasome. Vigneron N, Ferrari V, Stroobant V, Abi Habib J, Van den Eynde B.
J Biol Chem. 2017; 292(51):21170-9. Learning from the Proteasome How To Fine-Tune Cancer Immunotherapy. Vigneron N, Abi Habib J, Van den Eynde BJ. Constitutive IDO1 Expression in Human Tumors Is Driven by Cyclooxygenase-2 and Mediates Intrinsic Immune Resistance. Hennequart M, Pilotte L, Cane S, Hoffmann D, Stroobant V, De Plaen E, Van den Eynde BJ. Cancer Immunol Res. 2017; 5(8):695-709. Long-Peptide Cross-Presentation by Human Dendritic Cells Occurs in Vacuoles by Peptide Exchange on Nascent MHC Class I Molecules. Ma W, Zhang Y, Vigneron N, Stroobant V, Thielemans K, van der Bruggen P, Van den Eynde BJ. The capture proteasome assay (CAPA) to evaluate subtype-specific proteasome inhibitors. Expression profile of the human IDO1 protein, a cancer drug target involved in tumoral immune resistance. Vigneron N, van Baren N, Van den Eynde BJ. A spliced antigenic peptide comprising a single spliced amino acid is produced in the proteasome by reverse splicing of a longer peptide fragment followed by trimming. Michaux A, Larrieu P, Stroobant V, Fonteneau JF, Jotereau F, Van den Eynde BJ, Moreau-Aubry A, Vigneron N.
Analysis of the processing of seven human tumor antigens by intermediate proteasomes. Guillaume B, Stroobant V, Bousquet-Dubouch MP, Colau D, Chapiro J, Parmentier N, Dalet A, Van den Eynde BJ. Reversal of tumoral immune resistance by inhibition of tryptophan 2,3-dioxygenase. Pilotte L, Larrieu P, Stroobant V, Colau D, Dolusic E, Frédérick R, De Plaen E, Uyttenhove C, Wouters J, Masereel B, Van den Eynde BJ. Proc Natl Acad Sci USA. 2012; 109(7):2497-502. An antigenic peptide produced by reverse splicing and double asparagine deamidation. Dalet A, Robbins PF, Stroobant V, Vigneron N, Li YF, El-Gamil M, Hanada K, Yang JC, Rosenberg SA, Van den Eynde BJ. Proc Natl Acad Sci USA. 2011; 108(29):E323-31. Two abundant proteasome subtypes that uniquely process some antigens presented by HLA class I molecules. Guillaume B, Chapiro J, Stroobant V, Colau D, Van Holle B, Parvizi G, Bousquet-Dubouch MP, Théate I, Parmentier N, Van den Eynde BJ. Proc Natl Acad Sci U S A. 2010; 107(43):18599-604. Production of an antigenic peptide by insulin-degrading enzyme. Parmentier N, Stroobant V, Colau D, de Diesbach P, Morel S, Chapiro J, van Endert P, Van den Eynde BJ. An antigen produced by splicing of noncontiguous peptides in the reverse order. Warren EH, Vigneron NJ, Gavin MA, Coulie PG, Stroobant V, Dalet A, Tykodi SS, Xuereb SM, Mito JK, Riddell SR, Van den Eynde BJ. An inducible mouse model of melanoma expressing a defined tumor antigen. Huijbers IJ, Krimpenfort P, Chomez P, van der Valk MA, Song JY, Inderberg-Suso EM, Schmitt-Verhulst AM, Berns A, Van den Eynde BJ. An antigenic peptide produced by peptide splicing in the proteasome. Vigneron N, Stroobant V, Chapiro J, Ooms A, Degiovanni G, Morel S, van der Bruggen P, Boon T, Van den Eynde BJ. Evidence for a tumoral immune resistance mechanism based on tryptophan degradation by indoleamine 2,3-dioxygenase. Uyttenhove C, Pilotte L, Théate I, Stroobant V, Colau D, Parmentier N, Boon T, Van den Eynde BJ.